Yesterday, I had written that I was hoping for a hint of spring “crossing my fingers for a little bit of spring magic. Some greenery, a slant of light, maybe a bit of bird fluff” and today as I walked back to the office from my car, carrying some forced hyacinths tucked in a bag, a robin chirruped at me from the top of a three-foot snow bank. 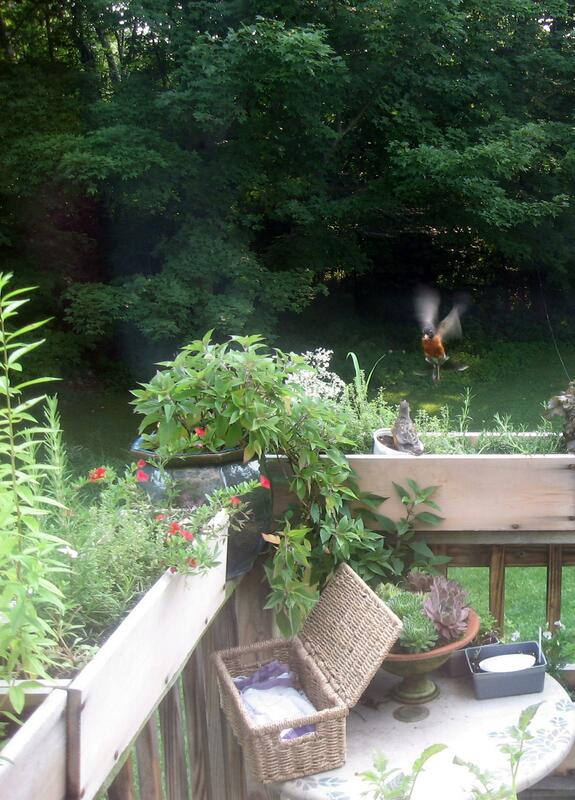 It’s a bit early for robins in Vermont (although some do overwinter here). I saw a flutter of feathers, the tilt of a head, and robin eyes focused in my direction, not even three feet in front of me, on top of a snow bank between street and sidewalk. I slowed my pace, the robin looking straight at me (well, as straight as it could with a tilted considering head). And then, a little hop or two on bird feet and it “chirruped” at me. I stopped completely, a bit uncertain at being so closely considered: avian scrutiny and at close proximity. And just like that, away and gone, while I followed with my eyes, across a roof and out of sight. So, there it was, my wished for spring magic. Years ago, in a long ago May, I came across a baby robin in my garden with no nest in sight. I nearly stepped on it, looking down just in time by chance. It was just starting to feather, pink skin showing through barely there sparse feathers and fluff. 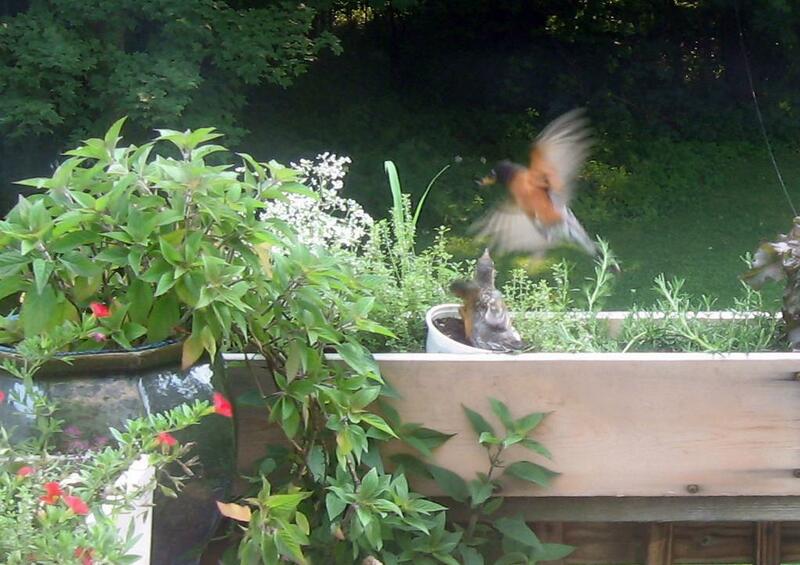 At that time I lived in a suburban type of neighborhood patrolled by cats, so I hung a small basket in a tripod made of tall garden stakes next to where it was found and placed the baby robin in it, in the hope a robin parent would come to the rescue. Robins are protected by the Migratory Bird Act so it’s illegal (in the United States, perhaps North America or further) to take one into your house, even with patrolling cats. I don’t know to what extent it is enforced, but I did a bit of poking around before posting this story. As a result, I recommend following this advice on what one should do if you find a baby robin. The parents of the baby robin I found did eventually spot the baby robin, feathered out a bit more as time had passed, on my back deck. I noticed an intent robin on a nearby garage roof and stepped away inside. A mature robin flew in, and back with a worm. And after a bit, then as now, just like that, away and gone, back to where it belonged. That’s a wonderful story about the baby Robin you found, it’s so interesting to watch nature close by. 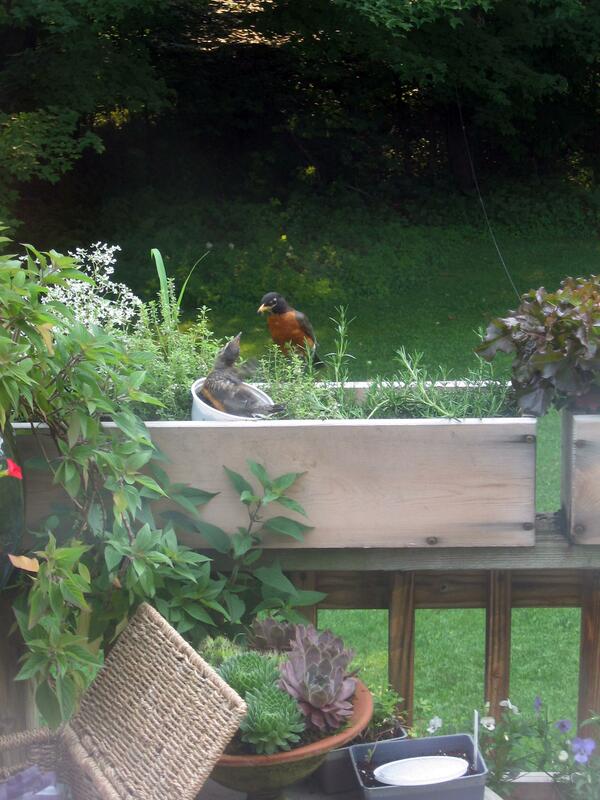 Yes–I took the photos of the robins through a window. In retrospect, I wonder if the bluejay was looking for a meal. Birds can take care of themselves, but there’s nothing wrong with giving a helping hand. Daphne, wonderful memories. Some years, robins seem to be overly optimistic in timing their arrival. Hope that today (18 degrees day-time high) is the last really COLD day of this Winter. 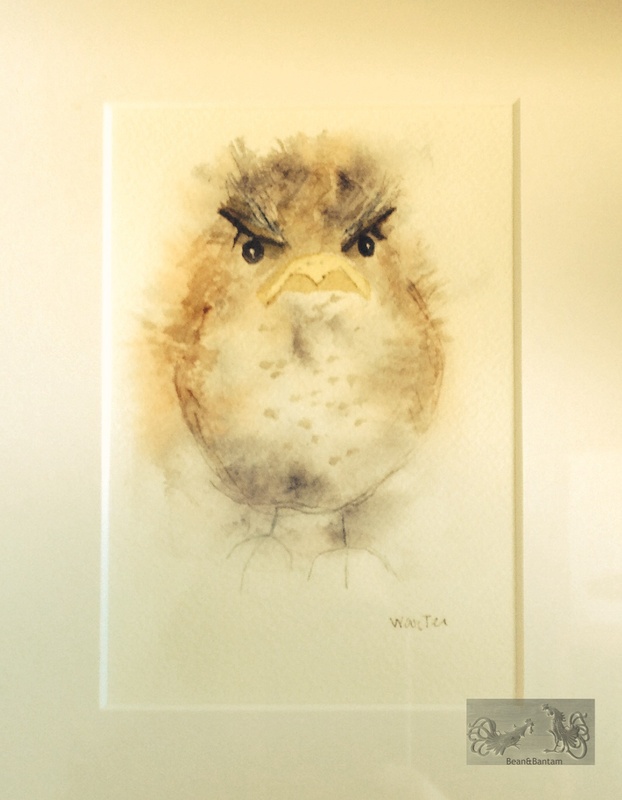 Tell us about your anticipated baby heirloom heritage chickens– what news? I hope we are due for warmer weather soon. Mottled java chicks postponed to April, due to bad weather. D. We are birds of a feather. I saved a baby crow. That is why I love them so much. Ellie was a joy. We raised her while her parents watched every day. Go search my blog for baby crows and there you will find her all feet and beak. You got a gift from nature and the Robins know you are one of the “good ones”. That is why you got a pre sring visit. They knew you needed their reassuance. It is such a magnificent experience to watch nature up close. What is the most magical: it is available to anyone willing to take the time.